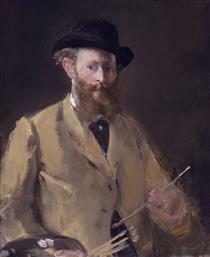 A pivotal figure in the transition from Realism to Impressionism, Edouard Manet was an influential painter who left his own unique mark on the art world. As a child, his father was a judge, who wanted him to pursue a career in law, but his uncle, recognizing little Edouard’s talents, encouraged his interest in art, often taking him the Louvre. It was not until Manet failed two entrance exams into the French Navy that his father relented to his son’s wishes and allowed him to start art lessons under the academic painter Thomas Couture, who had him copy the works of the great masters in the Louvre. The young artist was also influenced by Frans Hals, Diego Velazquez, and Francisco Goya. 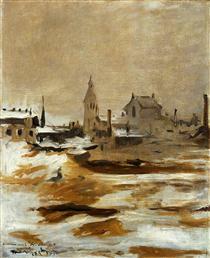 In 1856, in his early thirties, Manet opened his own studio. 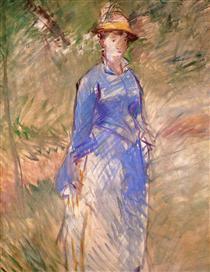 He began painting in a quasi-realist style, which transitioned to a more Impressionist style when he met the painter Berthe Morisot, who exposed him to her circle of Impressionist painter friends, including Claude Monet, Pierre-Auguste Renoir, and Edgar Degas, and their plein air painting techniques. 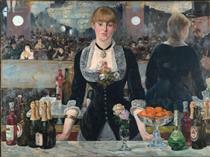 Many of Manet’s works revolved around depictions of leisure activities, including observations of social life in all of the classes, from bourgeois horse racing to prostitutes drinking, to the streets of Paris and boating scenes, many of which were made from sketches done on the spot. 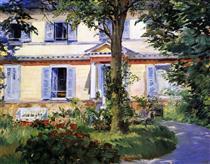 Although his work was Impressionistic, he resisted involvement with any specific style of painting, and thus preferred to present his works to the Salon of Paris rather than the many Impressionist Exhibitions. In 1875, some of his paintings were included in a book-length edition of Edgar Allen Poe’s The Raven and in 1881, he was awarded the Legion of Honor by the French government. 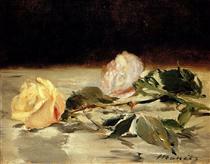 Manet died eleven days after the amputation of his left foot due to gangrene, from complications of syphilis and rheumatism, which had been so bad as to cause partial paralysis in the years leading up to his death. 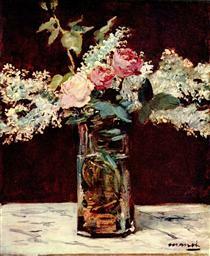 Édouard Manet (US: /mæˈneɪ/ or UK: /ˈmæneɪ/; French: [edwaʁ manɛ]; 23 January 1832 – 30 April 1883) was a French painter. He was one of the first 19th-century artists to paint modern life, and a pivotal figure in the transition from Realism to Impressionism. 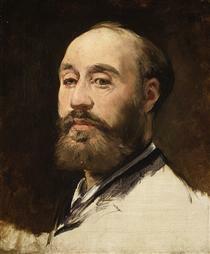 Édouard Manet was born in Paris on 23 January 1832, in the ancestral hôtel particulier (mansion) on the rue des Petits Augustins (now rue Bonaparte) to an affluent and well-connected family. His mother, Eugénie-Desirée Fournier, was the daughter of a diplomat and goddaughter of the Swedish crown prince Charles Bernadotte, from whom the Swedish monarchs are descended. 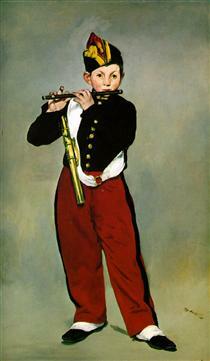 His father, Auguste Manet, was a French judge who expected Édouard to pursue a career in law. 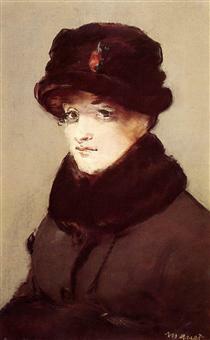 His uncle, Edmond Fournier, encouraged him to pursue painting and took young Manet to the Louvre. In 1841 he enrolled at secondary school, the Collège Rollin. 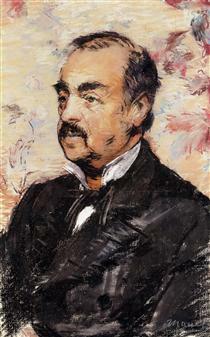 In 1845, at the advice of his uncle, Manet enrolled in a special course of drawing where he met Antonin Proust, future Minister of Fine Arts and subsequent lifelong friend. At his father's suggestion, in 1848 he sailed on a training vessel to Rio de Janeiro. After he twice failed the examination to join the Navy, his father relented to his wishes to pursue an art education. From 1850 to 1856, Manet studied under the academic painter Thomas Couture. 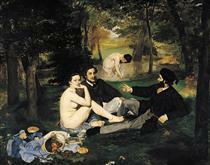 In his spare time, Manet copied the Old Masters in the Louvre. 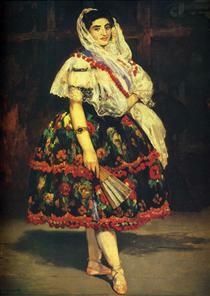 From 1853 to 1856, Manet visited Germany, Italy, and the Netherlands, during which time he was influenced by the Dutch painter Frans Hals, and the Spanish artists Diego Velázquez and Francisco José de Goya. 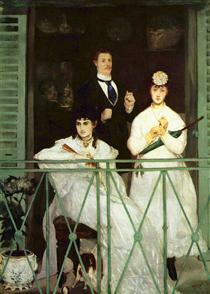 In 1856, Manet opened a studio. His style in this period was characterized by loose brush strokes, simplification of details and the suppression of transitional tones. Adopting the current style of realism initiated by Gustave Courbet, he painted The Absinthe Drinker (1858–59) and other contemporary subjects such as beggars, singers, Gypsies, people in cafés, and bullfights. After his early career, he rarely painted religious, mythological, or historical subjects; examples include his Christ Mocked, now in the Art Institute of Chicago, and Christ with Angels, in the Metropolitan Museum of Art, New York. 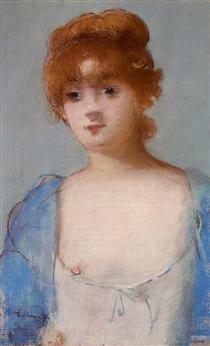 Manet had two canvases accepted at the Salon in 1861. A portrait of his mother and father, who at the time was paralysed and robbed of speech by a stroke, was ill-received by critics. The other, The Spanish Singer, was admired by Theophile Gautier, and placed in a more conspicuous location as a result of its popularity with Salon-goers. 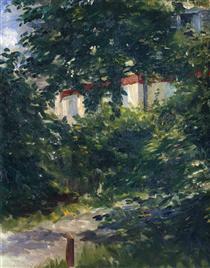 Manet's work, which appeared "slightly slapdash" when compared with the meticulous style of so many other Salon paintings, intrigued some young artists. 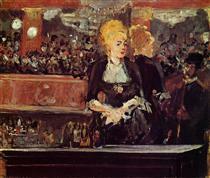 The Spanish Singer, painted in a "strange new fashion [-] caused many painters' eyes to open and their jaws to drop."